From Kalamazoo, travel north on US-131 to Exit 44 for D Avenue. Turn right (east) and continue three miles to Westnedge Avenue. Turn right (south) onto Westnedge. The site entrance is about one mile south of D Avenue on the left (east) side of Westnedge. Habitat Haven (.5 mile) This barrier free trail winds through many habitats, with interpretive signs. This trail traverses a beech-maple forest, a fen, swamp, and overlooks a pond. The diversity of habitats makes this an excellent trail to spot wildlife. You might hear deer crashing through the woods, see water snakes swimming in Trout Run Stream, or find dragonflies patrolling the pond. Bird watching opportunities abound. Prairie Farm (.5 mile) Easy walk linking Valley Trail with Prairie Pathway. Succession is beginning to occur in this old field; sumac and other bushes grow among wildflowers, producing shade and soil that encourages more shrubs and trees to grow. Many songbirds and small mammals find shelter in this shrubby area. Prairie Pathway (.75 mile) Easy walk along fields to a restored prairie. The prairie is awash with color from May through September. Big bluestem and other grasses tower over lead plant, spiderwort, black-eyed susans, purple coneflower, butterfly milkweed, and other prairie flowers. These unique plants attract myriad butterflies and other insects. Insect-eating and seed-eating birds also find plentiful food here. 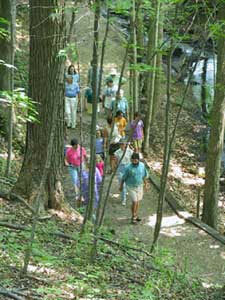 Beech-Maple (.65 mile) This trail will take you through an old growth beech-maple forest, along a sparkling stream. On late winter evenings, listen for the calls of barred and great horned owls. Blue-eyed Mary cascades down a hillside in spring. Trout lily, trillium, marsh marigold, spring beauty, and many other wildflowers also bloom in abundance here. Cooper's Overlook (.2 mile) This trail runs along a ridge with large trees overlooking Trout Run Stream. Find mayflowers, long-spurred violets, trillium, and hepatica along the ridge in spring. Explore the community of insects, worms, and fungi that inhabit the large logs along this trail. Enjoy colorful foliage in the fall. Green Heron Ravine (1.2 miles) This is a moderate hike through a young forest, past small ponds. Look for raccoon, fox, deer, and other tracks in the winter. Listen for woodpeckers, frogs, songbirds, and woodcock in the spring. Pioneer Woods (1.7 miles) Walk through farm fields and a spectacular beech-maple forest to the pristine Source Pond, the headwater of Trout Run Stream. Spring wildflowers abound under towering trees. Search for wood ducks, kingfishers, and turtles at the Source Pond. Listen for spring peepers, warblers, and thrushes. Ridge Run (.95 mile) Take a moderate hike through young woodlands, pine plantations, and old meadows, including a short, steep climb. Glaciers once carried the huge boulder that now rests at the top of the rise. Watch for bats on summer evenings. This is an excellent trail for viewing fall foliage and sunsets. Trout Run Trail (.6 mile) Walk through a mature forest overlooking Trout Run Stream, with a good view of the cattail marsh bordering the stream. Listen for downy, red-bellied, and pileated woodpeckers. Look for beech-drops, a parasitic flowering plant, growing on the roots of beech trees. River Vista (.15) Take a steep hike, which crosses Trout Run Stream to one of the highest points in the county. Enjoy a spectacular view of the Kalamazoo River Valley, especially in autumn. Watch hawks and vultures soar overhead. Hike down to old gravel pits and look for fossils, mudstone, sandstone, and granite. Valley Trail (.6 mile) This trail descends steeply to a small pond. Hike past the maple sugar house and through a beech-maple forest. Look for spicebush and wildflowers blooming in the spring, and signs of deer and wild turkey. Spot huge maple, beech, and oak trees that have been growing here for more than a century. Mature beech-maple forest, wetlands, ponds, streams, open fields, river, and restored prairie all can be found in this educational nature center just north of downtown Kalamazoo. Originally preserved to prevent gravel mining in the beech-maple forest, this site now boasts an extensive interpretive center, human environments (historical) area, arboretum, trail network, and butterfly/hummingbird garden. A nice variety of songbirds and small mammals can be seen at the interpretive center viewing window year-round. While you’re there, ask for trail maps and some of the other excellent educational materials available. Be sure to take advantage of the other interpretive facilities and programs within the center as well. When you’re finished inside the center, walk the Habitat Haven Trail to the pond and along the Trout Run stream for excellent probability of viewing frogs, turtles, and aquatic insects. Painted turtles often can be seen sunning themselves on logs in the water. The quiet, stealthy hiker also has a fair-to-good chance of seeing muskrats and snakes. The Beech-Maple Trail winds among massive beech and maple trees that stand as monuments to a bygone era. The River Vista Trail offers excellent opportunities to view bluebirds, and ends at a beautiful overlook of the Kalamazoo River Valley. During fall migration, you may see large kettles (groups or “flocks”) of hawks soaring above the river valley. See how many you can count and identify. See the link to hiking trails below for more information on the excellent grid of trails that criss-cross the area. In the center of the grounds (before you get to the interpretive center) you can walk through the butterfly/hummingbird garden and arboretum to become familiar with many varieties of plants, shrubs, and trees. The colors here in spring and summer are spectacular. Also view the many colorful critters that are attracted to the blossoms. Butterfly viewing is excellent. Restrooms – Three restrooms and two pit toilets. Hiking trails – Eleven trails that cover 8 miles. Detailed descriptions of all trails can be found in a link below. Learn more about the Kalamazoo Hiking Trails. Picnic – Picnic area available in arboretum. It is available for rental. Visitor Center – Open Monday through Saturday, 9-5; Sunday 1-5. Cross Country Skiing – Available on trail network. No rental equipment on site. Drinking Water – Two water fountains at Nature Center. Entry Fee – Call for current rates. Barrier-free – Interpretive Center, Beech-Maple Trail, Habitat Haven Trail, parts of other trails.